Pricing is for a case of 24 bulbs Sylvania 25W T6 Warm White Fluorescent Light Bulb - F42T6/WW - Description: 25W, 42" MOL T6 instant start Slimline fluorescent lamp, Warm White phosphor, 3000K color temperature, 52 CRI. Average Rated Life (hr) 7500, Base Single Pin, Bulb T6, Manufacture Sylvania. 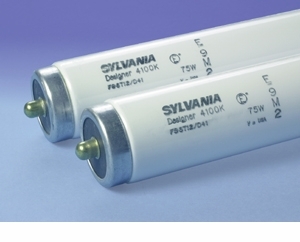 Sylvania 25W T6 Warm White Fluorescent Light Bulb - F42T6/WW - Description: 25W, 42" MOL T6 instant start Slimline fluorescent lamp, Warm White phosphor, 3000K color temperature, 52 CRI. Average Rated Life (hr) 7500, Base Single Pin, Bulb T6, Manufacture Sylvania.